Indian Lake Nazarene Camp (ILNC) began in 1926 when 32 acres were purchased by the Michigan District Church of the Nazarene. Today, 200+ acres of property are nestled on the shoreline of Indian Lake in Kalamazoo County near Vicksburg, MI. We offer hotel style rooms, group dorms, rustic cabins, RV lots, camping sites, recreational activities, meeting spaces and dining facilities for the various camping, meeting and training needs of our families, residents and guests. Many of our activities allow families to draw away from the busyness of normal life just to be together. These are the times that make great memories and help families prioritize relationships. For decades boys and girls, youth and adults have been coming to these grounds to grow in relationship with God and one another. It is a true delight to hear stories of shared memories made here during camps, family gatherings or just a weekend spent with friends. We invite you to make ILNC your camp. We believe each person deserves dignity and love because we are created in God’s image and designed to flourish in relationships. We want everyone to enjoy the reconciliation available through Christ and to live out the benefits of reconciliation by how we treat each other. Welcome to the family! 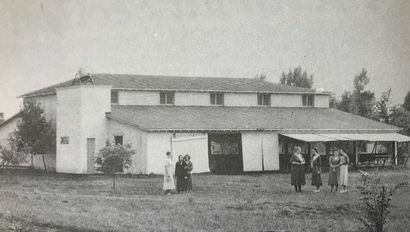 During the 1922 Assembly for the Michigan District Church of the Nazarene, it was decided that the church was in need of a place to hold camp meetings. A Camp Meeting Committee was formed to find a suitable site. At the 1926 District Assembly held in Flint, an outpouring of the spirit led the committee to inspect a piece of property for sale near the village of Vicksburg. The men left the meeting that night and reported back to the assembly the next day. The assembly voted to purchase the piece of property that we now call Indian Lake Nazarene Camp. Within a year, a Tabernacle was built to hold a thousand people and by the next summer it was full of people. Children loved summers at the lake, and parents enjoyed the holiness preaching. Indian Lake Nazarene Camp quickly became a favorite destination for many families who spent two weeks living in tents every summer. As time progressed so did the grounds. More property was purchased over the years. Cabins took the place of tents, asphalt replaced the dusty roads, the dining hall replaced the hours of mothers cooking throughout the week; modern utilities made life a little easier for those staying at the camp. ​While the camp may look a little different from when it was purchased in 1926, there is one thing that remains the same...Indian Lake Nazarene Camp provides a place where lives are changed. We are continuously striving to provide a place where people can come to be reconciled with God and each other. It is our prayer that when people come to ILNC that they come to get away from the hustle of life and build their relationship with God and the body of Christ. So weather you are a man, women, youth, camper, board member, scrapbooker, or quilter in need of restoration, we hope that you are able to find peace, fellowship and God here.